The Eccotemp 45HI-LP is the largest indoor model of the Eccotemp tankless line. Rated at impressive 6.8 GPM and 140,000 BTU per hour, the 45HI-LP can meet all the hot-water needs of a standard home or apartment with one or two bathrooms, as well as smaller commercial applications. The compact, wall mounted 45HI-LP is powered by liquid propane and is also split system adaptable, which can further increase efficiency and hot water delivery speed. With its fully automated control system, the Eccotemp 45HI-LP is the ideal choice for any standard sized home. Enjoy your heating appliance all year round without ever having to worry about refilling a propane tank! Our 50K Natural Gas Conversion Kit allows you to conveniently connect your heating appliance to your home's existing gas supply. Easily attach and detach the hose with our patented Quick Connector as needed, and enjoy a clean burning flame. You will never run out of gas! This kit includes everything you need to safely convert your heating appliance from liquid propane to natural gas. Tough cleaning jobs are a thing of the past with the powerful and versatile Dremel Versa. High-speed scrubbing, in a compact size, is ideal for tackling soap scum, baked on food, difficult grease, dirt and much more. The Lithium-Ion battery charges fast and is perfect for indoor and outdoor, dry and wet uses. The light-weight and compact design is ideal for single hand use and to tackle hard to reach places. Accessories changes are fast with the hook and loop interface. Switch from tile to glass, or upholstery to metal in no time, and use the Dremel Versa with our without water and cleaner based on the application. Leviton Compact Fluorescent Lamp-holders are ENERGY STAR rated. An energy-efficient alternative to incandescent fixtures and meets the NFPA and CEC requirements. Designed to reduce the risk of fire in closets, they are also ideal in garages, basements, utility rooms and attics. It works with a standard wall switch and is easy to install. Controlling lights, shades, and temperature from a mobile device has never been easier or more reliable. The Lutron Smart Bridge allows for setup, control, and monitoring of Caseta Wireless dimmers and Serena Remote Controlled Shades from a Smartphone, tablet, and even your Apple Watch TM wearable. The Lutron Smart Bridge also works with Nest, select Honeywell Thermostats, Logitech Harmony remotes, Apple HomeKit and Xfinity Comcast. Schedule lights to adjust automatically based on the time of day, or create your favourite scenes that adjust multiple lights and shades with the press of a button. Enable geofencing to automatically turn your lights on/off when you leave or approach home, or to notify you that you left your lights on. Kit includes: (1) Casita Wireless Smart Bridge, (2) Casita Wireless in-wall light dimmers, (2) Pico remote controls, (2) pedestals, (2) one gang Claro wall plates All compatible products sold separately. 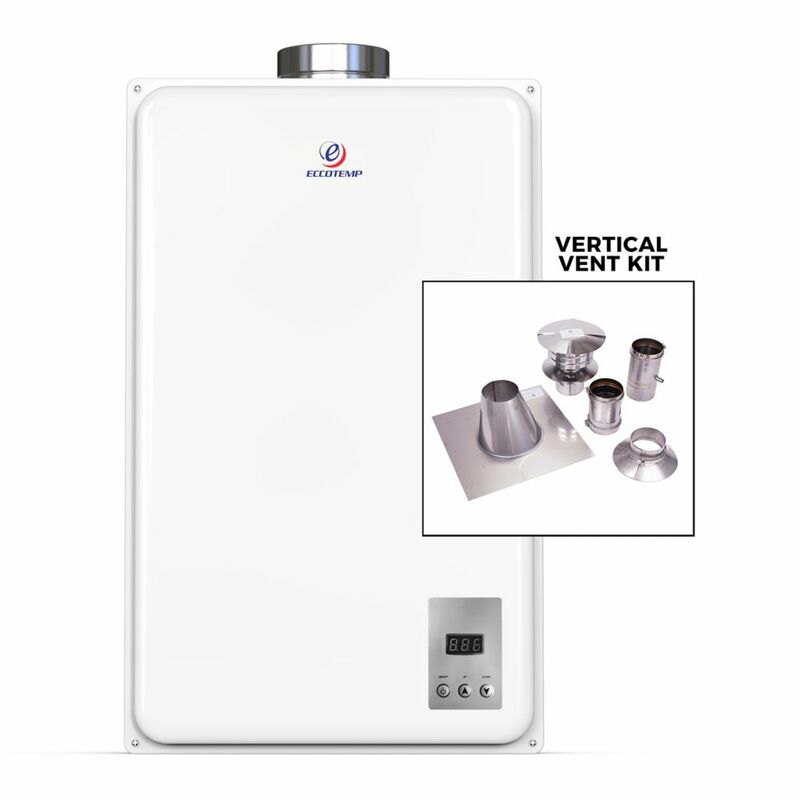 45HI-LP 26 LPM 140,000 BTU Liquid Propane Gas Indoor Tankless Water Heater with Vertical Vent Kit The Eccotemp 45HI-LP is the largest indoor model of the Eccotemp tankless line. Rated at impressive 6.8 GPM and 140,000 BTU per hour, the 45HI-LP can meet all the hot-water needs of a standard home or apartment with one or two bathrooms, as well as smaller commercial applications. The compact, wall mounted 45HI-LP is powered by liquid propane and is also split system adaptable, which can further increase efficiency and hot water delivery speed. With its fully automated control system, the Eccotemp 45HI-LP is the ideal choice for any standard sized home. 45HI-LP 26 LPM 140,000 BTU Liquid Propane Gas Indoor Tankless Water Heater with Vertical Vent Kit is rated 5.0 out of 5 by 1. Rated 5 out of 5 by Paul from Went up without a hitch, It's and adjustment with the... Went up without a hitch, It's and adjustment with the sounds of it working but works well and I believe a good saving on gas with no pilot light. Can I use this unit for in floor heating?